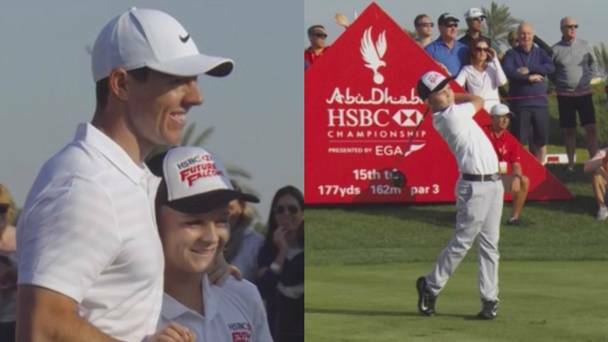 A special invitation was extended to 13-year-old Oscar Murphy during the opening round of the Abu Dhabi HSBC Championship last week. The Northern Irelander, who plays to an impressive six-handicap, was asked to participate in a special “Beat the Pro” challenge on the Abu Dhabi GC’s 177-yard 15th hole, against his idol, Rory McIlroy, World No. 1, Dustin Johnson, and 2017 Race to Dubai winner, Tommy Fleetwood. And Murphy did not shy away from the pressure of the moment. Rather, he put a beautiful-looking swing on the ball and landed it significantly closer to the pin than either DJ or Fleetwood did. What makes the feat even more impressive is that not only did Murphy play the shot from the back tees, but he also used a 3-wood to pull it off — unlike the more precise and easier-to-hit higher irons that McIlroy, DJ, and Fleetwood all used. There aren’t too many teenagers who can brag about hitting better tee shots than two of the world’s best golfers, but Murphy legitimately can after that performance last week. Kudos to the young man! What is the point of using a GPS-tracking app to track your stolen property if the police cannot legally use that information to retrieve your belongings? That is the question that New Zealand native Tom Owen has been asking authorities recently after being told by law enforcement that his stolen golf clubs could not be recovered, despite having knowledge of the exact location where they were being held. In December, Owen’s entire golf bag — minus his driver — was stolen while he was golfing at Howick Golf Course in Musick Point. Since his cell phone was also in his bag at the time it was stolen, Owen was able to use a mobile-tracking app to determine that his property had been taken to a nearby residence on Pidgeon Mountain Road in East Auckland. However, when he relayed that information to the local police department, Owen was told that it was not substantial enough to justify a search warrant, and that the police could only knock on the door to inquire about the matter without actually entering the premises. As a result, Owen tried to take matters into his own hands, first by calling his phone and then by knocking on the door of the Pidgeon Mountain Road home and then by eventually confronting the residents himself. However, Owen was unsuccessful in both endeavours, and has now resigned himself to the idea that he will never be reunited with his clubs or cell phone again. “It’s very frustrating to know where your stolen items are and not have anyone do anything about it,” Owen told the local media. “If police really can’t act on the information you give them, then something needs to change.” Poor Tom! Hopefully, his golf buddies all chip in and surprise him with a new set of clubs. Grayson Murray played extremely well in the opening round of the CareerBuilder Challenge last week, carding a 7-under 65 on PGA West that included four birdies over his final four holes. But, it was a moment on the 16th hole on Thursday that had the entire golf blogosphere chuckling throughout the weekend. Murray’s approach shot on the par 5 found its way into an extremely deep fairway bunker to the left of the green. And rather than carefully plodding down a steep ramp to get into the trap, the Raleigh native whimsically slid down the 20-foot embankment into the bunker on his backside, much to the delight of the spectators on hand. Moments later, the 24-year-old secured his birdie by hitting a spectacular semi-blind sand shot to less than two feet from the pin. Murray credited his caddie for advising him to slide, when asked about it after the round. “I didn’t think it was going to be that smooth of a ride,” Murray said. “But it was pretty good!” To be honest, it’s refreshing to see Murray starting off the year with some positive headlines, after having being marred in so many extra-curricular controversies during his rookie season on the PGA Tour last year. Let’s hope that trend continues for the rest of the season! Slam dunking any type of golf shot is extremely impressive. But, doing it between your legs while facing the wrong way is some next level trickery. 10/10! Zero yards of carry. Negative-one yard of roll!